A new episode has landed! In this episode, we’re unveiling wild new poetry in translation from Asymptote’s Fall Issue, by taking a close listen to poems by Iran’s Rasool Yoonan (read in Persian by Amir Maleki and in English by Siavash Saadlou), Singapore’s Tan Chee Lay (read by the poet himself) and Iraq’s Jan Dammu (read by translator Suneela Mubayi). Metaphors unfurl from these lines and stretch into works of art. Finally, we’ll consider the written component of the multimedia poem, “First Person,” by Taiwan’s Hsia Yü. To help us unpack how a translator navigates the original writer’s web, our podcast editor Layla Benitez-James turns to Anita Raja’s essay, “Translation as a Practice of Acceptance“, which we also featured in the Fall 2016 issue. 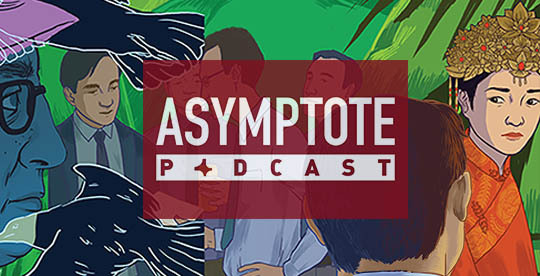 Exploring lies, little and big histories, and figuring out what Proust is doing in an action movie, this is the Asymptote podcast.